Acupuncture can help with holiday stress, anxiety and holiday blues and depression. Financial concerns, gift giving, busy schedules, family obligations, weight gain and lack of exercise all play into the “holiday cheer”. 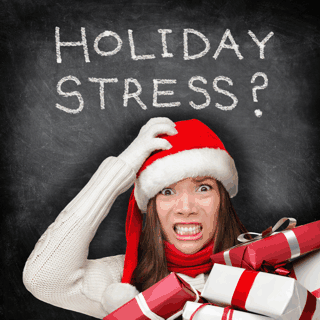 The end of year, travel, family get-togethers, extra social events, reduced sleep, poor eating brought on from not enough time to eat healthier, along with too many holiday party treats — wow, can all add up to a lot of stress and anxiety! For many people, the holidays in general may be a cause for stress and depression. It can seem that the entire world, from the commercials we see on television, to holiday carols and decorations, etc — all of this may seem overwhelming to people who may already be dealing with a health concern, or be saddened that their family members are not around, or they may feel all alone — when it may seem as though the rest of the world is having a party. Acupuncture and Traditional Chinese Medicine concepts help to connect the mind, body, and spirit. Studies suggest that Acupuncture–which is focused on restoring the body’s energy (qi), can work to reduce symptoms of depression, decrease anxiety, and help relieve stress. Traditional Chinese medicine concepts take into account a person’s entire body system, including physical conditions and emotional symptoms. Acupuncture treatments and herbal supplements are uniquely tailored to each patient with the goal of healing the body and mind, as well as revitalizing their spirit. The holiday season is a good time to schedule an appointment for Acupuncture. Don’t let the stress and anxiety of the season cause your immune system to get run down. Regardless of the season it is always important to making sure that the immune system is nourished and functioning well, as part of a person’s overall quest to be healthy – but the holiday season can bring on added challenges. Give us a call for an appointment. Let us help you to stay on the road of good health.